Since their release in 2011, the ninja in NINJAGO have had a range of several different suits. These different suits can indicate that a ninja has achieved a certain rank or status, or have a more practical reason such as protection from a certain type of enemy. The four original ninja (Cole, Jay, Kai and Zane) were all seen wearing their trainee ninja robes from the first episode in the first wave of NINJAGO sets in 2011. DX (Dragon eXtreme) ninja robes, also known as Dragon Extreme Gi, were a sign of the ninja achieving DX ninja status. This status was earned by the ninja when they managed to tame their Elemental Dragons. 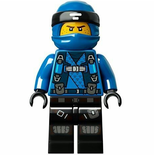 In addition to this, by unlocking their Dragon Extreme abilities, the ninja gained extra Spinjitzu powers. The four original ninja had their DX suits released in the first wave of NINJAGO sets in 2011 alongside their Trainee robes. 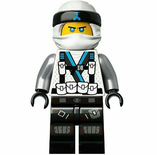 Additionally, Lloyd was retroactively granted his DX robes in 2014 when 5004076 Minifigure Gift Set was released. The ninja receive their new armour when Sensei Wu teaches them Kendo. 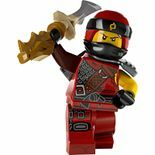 The ninja are seen training and fighting Serpentine in this armour, and were released in 2012. These variants are identical to the Trainee variants except for the extra chest armour and having the zukin swapped out for armoured masks. Through further practice and training, the four original ninja each achieved ZX (Zen eXtreme) status and earnt new ZX ninja robes, also known as Zen Extreme Armour. 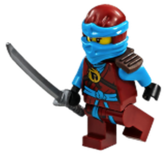 The ninja wore a new style of head wraps, and additionally usually wore shoulder armour which could hold two katana on the back, though they were also seen without it. 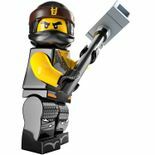 In 9443 Rattlecopter, Kai wore a jetpack in place of the shoulder armour. 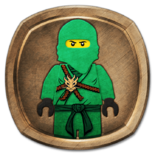 When Lloyd Garmadon joined the team and became the Green Ninja, he also wore ZX robes. The ZX ninja robes were first released in 2012. To gain their NRG status and robes, the ninja had to unlock their true potential. The original four ninja went about this in their own unique ways, and after they were successful, they achieved complete mastery over their respective elements. When in NRG form, the ninja also have heads coloured the same as their suits. Like the Kendo and ZX suits, the NRG robes were released in 2012. After losing their elemental powers, the ninja travel to the Temple of Light where they regain their powers and receive new suits. 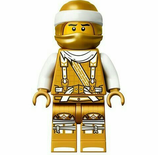 Additionally, in his first battle against the Overlord, Lloyd becomes the Golden Ninja. 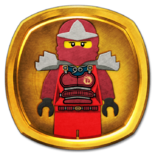 This gives him the potential to use the Golden Power- a combination of the main Elements of NINJAGO: fire, earth, lightning, ice and energy. 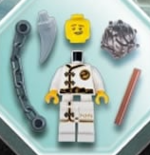 These suits were released in 2013, the exception being Lloyd's green suit which came out in 2012 with the first NINJAGO Character Encyclopedia. When the Nindroids threaten NINJAGO, the ninja are given Techno robes. This is the first type of ninja suit to not have some form of zukin (head wrap). Instead, the ninja wear bandanas to help block the Nindroid's facial-recogition software. Because of this, the ninja also come with hair pieces for the first time. The Techno robe variants made their debut in 2014. In addition to his standard Techno robe suit, Zane received an extra battle-scarred variant. This version shows the left side of his face, left arm and most of his upper body damaged, revealing his robotic Nindroid body. In addition to this, some later releases of the ninja Techno robes have them wearing a zukin instead of a bandana. The ninja wore Stone Warrior armour during their final fight against the Overlord. This armour protected them from the Golden Power which the Overlord had stolen from Lloyd. 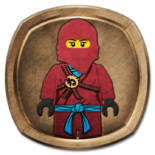 The first two to receive Stone Armour were Zane and Lloyd in 2014 sets, while the other three ninja received theirs later in promotional sets. 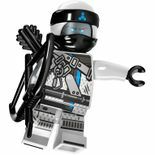 Kai received his armour in 2015 with 5004077 Minifigure Pack, Jay with the LEGO NINJAGO Character Encyclopedia: Updated and Expanded in 2016, and Cole will also be released in 2016 with 5004393 Cole. While in the Digiverse, Cole, Kai, Jay and Zane were briefly able to tap into Lloyd's Golden Power while he was being held captive in the real world. The power turned the four ninja's Techno robes gold, and with their temporary power they were able to defeat the Digital Overlord and destroy his digital form. To date, only Kai has a physical variant in these robes. Months after Zane sacrificed himself to defeat the Overlord, the surviving four ninja took part in the Tournament of Elements, a competition for Elemental Masters held by Chen. These new robes are sleeveless, but the ninja retain their bandanas. 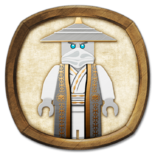 The Tournament robes were first released in 2015, but Zane retroactively received a Tournament robe variant in 2016 with 853544 NINJAGO Accessory Set. Towards the end of Chen's Tournament of Elements after it was revealed that Chen was stealing the Elemental Masters' power so that he could turn himself and his allies into Anacondrai, the ninja changed into new jungle robes. The ninja once again wore zukin, this time with their elemental symbol printed on the front of the head wrap. 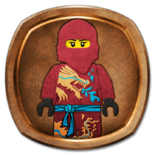 While not one of the ninja, Skylor, Elemental Master of Amber, also wore these robes and joined the ninja in their efforts to stop Chen, her father. Additionally, was revealed that a part of Zane had survived in his fight with the Overlord, and he rebuilt himself into the Titanium Ninja. Zane's robes are in a similar style to the other ninja's jungle robes, but he wears silver instead of his traditional white. 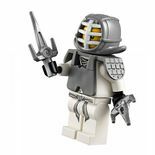 Variants of Zane's Titanium variant onwards use a double-sided silver head, with one side featuring a protective blue visor over his face. When the ghost of Morro, Elemental Master of Wind, escaped from the Cursed Realm and summoned his ghost ninja, the ninja were given armour made from Deepstone, a material mined from the bottom of the ocean that is able to prevent the ninja from being possessed by ghosts. 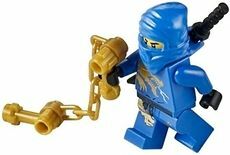 After it is revealed to Nya that her mother was an Elemental Master of Water and she has inherited those powers, she joins the ninja and receives her first ninja suit. As ghosts cannot survive touching water, Nya doesn't need to wear Deepstone armour but her armour has a similar style to the other five ninja. These suits were all first released in 2015. When the ninja learn Airjitzu, an extension of Spinjitzu, the ninja acquire new robes and the ability to fly in a small elemental vortex for a limited time. These robes fetaure their elemental symbols on the front of their chests, plain zukin and coloured heads. 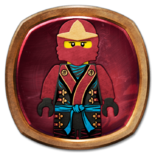 Cole, Jay, Kai and Zane had their Airjitzu robes released in 2015, while Lloyd's and Nya's were released a year later in 70590 Airjitzu Battle Grounds. After the djinn Nadakhan and his Sky Pirates invade NINJAGO, the ninja once again change into brand new Destiny Robes. For the first time, the ninja are seen wearing a new shoulder armour piece that protects the left shoulder, and holds two katana which run diagonally parallel down the back as opposed to forming an "X" shape. While normally wearing zukin, some of the ninja also are also seen wearing bandanas instead. Jay and Cole are also seen with two extra variants. In 70605 Misfortune's Keep, Jay doesn't wear a bandana or zukin, but has an eyepatch printed over his left eye, after a temporary injury in his fight against the Sky Pirates. Meanwhile, Cole is seen with a pale green head in 70593 The Green NRG Dragon and 70604 Tiger Widow Island, depicting him after he was turned into a ghost. These variants all saw their initial release in 2016. Fighting against a group of enemies previously encountered from the most recent battle with the Sky Pirates all the way back to their first battles with the Skullkin, the ninja adopt a new set of Honour Robes which have a similar basic appearance to the original Trainee robes, but take design elements from previous suits. Cole once again has a yellow face and is no longer a ghost, but has a green scar by his left eye. In some sets, the ninja wear bandanas instead of zukin. In 70589 Rock Roader, Cole comes in a set of RX robes. This variant features transparent arms with volcanic-esque printing, and the hand joints can be seen inside the arms. Cole is currently the only ninja known to have RX robes. All six ninja receive their own Fusion Armour, in the first wave of 2017 sets. All of the ninja wear a zukin with this suit, except for Kai who wears a zukin in 70627 Dragon's Forge but a bandana in 70621 The Vermillion Attack. The ninja sometimes have black shoulder armour when wearing these suits, but are also seen without it. The WU-CRU mini-site says these suits have the ability to give the ninja some degree of control over time and their own destiny, but no such ability is granted in the animated series. Taking place in a universe alternate to the main NINJAGO theme, these robes were released for The LEGO NINJAGO Movie. The ninja featured newly designed faces, hair pieces and preferred weapons. Additionally, Nya's crimson robe colour scheme was changed to grey, although the aqua highlights remained. Cole also had brown worked into his robes plain black robes. These changes would later be carried over to variants in the main NINJAGO universe that were released from 2018 onwards. Kai and Lloyd received Kendo armour variants for The LEGO NINJAGO Movie. These variants are the same as their normal ninja robes but with Kendo armour pieces placed over the top. 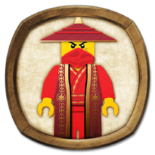 These robes were first found in The LEGO NINJAGO Movie sets, however 30530 WU-CRU Target Training was released under the NINJAGO theme. While the faces are the same those originally in The LEGO NINJAGO Movie, the hairpieces used are the same as the ones used prior to the changeover in 2018. 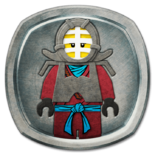 5005230 Zane's Kendo Training Pod is the only set to feature Zane in these robes, but was also released under the NINJAGO theme. The ninja were seen wearing these robes one year after the ninja's last encounter with Krux and Acronix, and Wu was lost in a time vortex. These variants, along with the Spinjitzu Master and Kendo outfit versions, are the first main NINJAGO universe variants where the ninja have faces, robe colours and preferred weapons originally found in The LEGO NINJAGO Movie. In the first episode of the Sons of Garmadon season in NINJAGO: Masters of Spinjitzu, this change is referenced by Jay. While talking with Cole about time travel theories, he mentions how if Wu went backwards in time when he went through the time vortex, it's possible that the timeline may have been altered in such a way that everyone would look different to how they used to and nobody would even know. 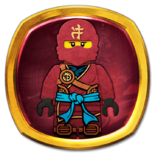 The Spinjitzu Master variants were released in 2018 in the same wave as the Sons of Garmadon robes. Each variant was accompanied with a spinner that the minifigure could be placed in. To date, these Kendo outfits have only been released for Lloyd, Cole and Jay. The outfits resemble black versions of the Spinjitzu Training robes. 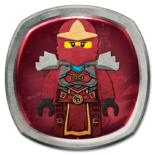 When Cole, Jay, Kai and Zane were transported to The Realm of Oni and the Dragons after using Traveller's Tea, their Sons of Garmadon robes were damaged. Kai, Jay and Zane modified their damaged robes at some point during their time in the First Realm with armour. Lloyd and Nya remained in Ninjago after the events of Sons of Garmadon. 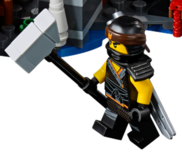 They gave themselves new suits to armour themselves against Garmadon’s forces. Skylor joined their resistance and received armour as well. The Dragon Master Flyer sets contained exclusive variants of Kai, Jay, Zane and Cole, as well as Wu in his Golden Dragon Master garb. The variants resemble flight suits. 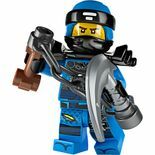 Images of a number of computer-generated suits which have not yet been released in sets have appeared in the WU-CRU game on LEGO.com, as well as in NINJAGO: Masters of Spinjitzu. 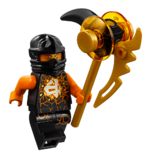 In NINJAGO: Masters of Spinjitzu, Cole, Kai, Jay and Zane briefly took on Lloyd's Golden Power in the Digiverse, turning their Techno Robes gold. While Kai has received a physical variant, the other three ninja have only been seen in these robes in the television series. Images of the ninja in sensei robes appeared in the WU-CRU online game in 2016. As Lloyd joined the team later than the original four ninja, some versions of the earlier suits have still not been released physically. Nya is the latest addition to the team of ninja, and like Lloyd, has never actually received physical versions of some suits that the ninja wore before she joined the team. She is the only one with a zukin instead of a bandanna on her techno robe. ↑ 4.0 4.1 NINJAGO: Masters of Spinjitzu - "Enter the Digiverse"
↑ "Big Trouble, Little Ninjago"
Facts about "NINJAGO ninja suits"
This page was last edited on 23 March 2019, at 22:06.